Prairie Junegrass Koeleria Cristata is a long lived perennial. Prairie Junegrass seeds can be started directly outdoors in spring or fall, and also called June Grass and Koeleria Macrantha, this native tuft forming perennial grass grows 1-2 feet tall, featuring attractive green-gray foliage and blooming with pale green-silvery colored flowers that look like long fuzzy spikes. June Grass blooms from May to July. 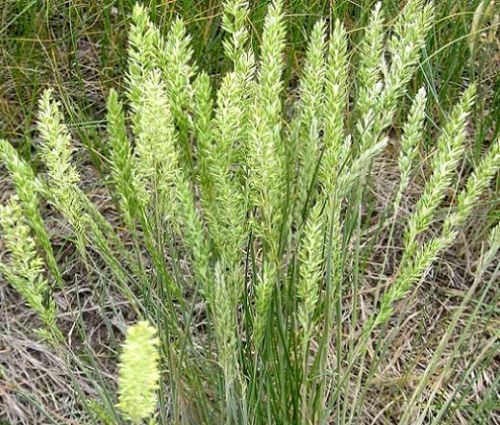 Prairie Junegrass is a cool season grass commonly found in sandy soil of dry upland prairies and open woods, and June Grass is used extensively for prairie restoration or it can be grown as an ornamental grass, ground cover or rock garden plant. Koeleria Cristata seeds germinate quickly producing the perennial grass that has upright growth habit, relatively fine leaves, and a deep root system. Prairie Junegrass tolerates drought and prefers sandy or coarser soils but will grow on clay loam soils.